Started kenpo karate at around 5 years old with a friend of my moms who was into it and had been doing it a while. I was hooked even before that because I loved martial arts flicks; yes the wing chun kung fu ones . At 10 years old I was signed up as a birthday gift into WTF taekwondo and did that for 3 years – obtained my first degree black belt. After that my focus was split somewhat on girls,the streets and school sports (which I was always an above average athlete so regular sports were easy). In 7th grade i remember we did that thing where they say: “what do you wanna be when you grow up?” my answer was clear – “kickboxer”. During this time my uncles (all 3) were boxers and one was a former pro boxer, he taught me to box – just the basics and then in 12th grade I started boxing at a local community center for about a couple months. I did more boxing about 5 years later and an amature boxing match which I won. I got in to lots of trouble got sent to the Handlon Michigan Training unit for a while ,it was a place for troubled young men, got there and at first I was on the same path until after a while I started to change and realized there was a whole different world out there that I didn’t know about and wanted to check out. I decide K-1 was what I wanted to do, to be with the big boys. At this time I was 202 lbs from eating good meals and going to college and lifting like an animal. I could squat 505 lbs for 2 reps,real squats not half way or sissy squats. 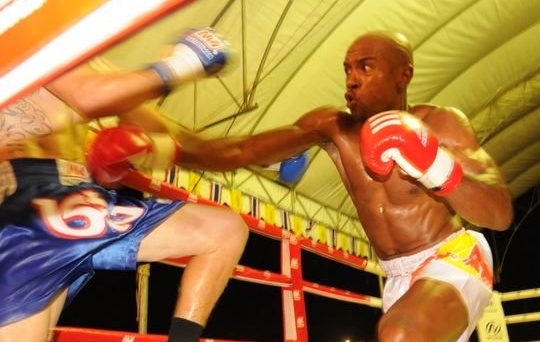 I got home in 2005 turned pro in 2006 and have been in Thailand Fighting for the past 3 years. Ive had over 50 pro fights now and still have a lot to achieve and more fights to have. I guess im hoping people will Tune In to this site and follow me and my fights, i have been gifted with friendships and support from family, friends and Jesus Christ my savior. I am hoping to get more support and sponsorship so i can continue to achieve and step things up to the next level. I take a lot into the ring with me – friends, family, God, heart and some axe kicks and spinning kicks as well. this is the story so far…..